Get some exercise while you're on vacation on one of the most iconic stretches of road in the world - the Las Vegas Strip! You will run past most of the major hotels and casinos on the strip as well as a stop at the famous "Welcome To Las Vegas" sign. Your guide will describe points of interest as well as stop and take pictures along the way. Your 4.2 mile run is designed for all levels of runners, from beginners to advanced. The Las Vegas Strip is probably the most iconic symbol in all of Las Vegas and most of the time it is seen by car on the way from point A to point B. A lot of the character of the Strip can be missed this way however, which makes this a great place to take in on your next Run/Walk. 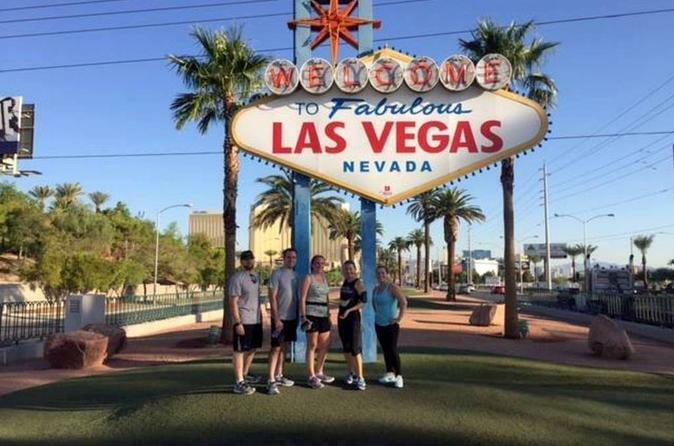 Las Vegas Strip Run Tour begins and ends centrally on the Las Vegas Strip. After a short warm up / stretch you're off and running. Your running tour is a 4.2 mile run and is designed for all levels of runners, from beginners to advanced. Your guide will describe points of interest as well as stop and take pictures along the way. Many sights can be seen on this run and it will give you a good workout with climbing stairs on the side street crossovers to sprinting to beat the lights. Depending on what time of year you run, you can get cooled off periodically by misters spraying a fog of mist on you along the the way. So leave your water bottle at home but make sure you bring your camera to take pictures of some interesting scenery. All running guides are CPR/First Aid Certified and carry First Aid kits and extra water with them.